The Caro-Kann Defence is one of the most solid replies for Black after 1.e4. I’ve played it myself for many years with black, so I know how difficult is to gain an advantage with white. My choice of the Advance Variation for White is because of the complex strategical play in which White has a long-term space advantage. If he also understands the ideas of this opening well, then White will be able to keep up the pressure. The Caro-Kann Defence is one of the most solid replies for Black after 1.e4. I’ve played it myself for many years with black, so I know how difficult is to gain an advantage with white. My choice of the Advance Variation for White is because of the complex strategical play in which White has a long-term space advantage. If he also understands the ideas of this opening well, then White will be able to keep up the pressure. 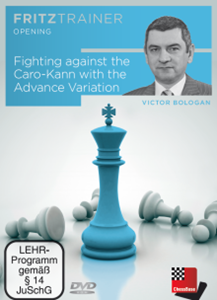 The fact that such players as Gashimov, Karjakin, Caruana, Anand, Svidler, Grischuk and Shirov often play the Advance Variation against the Caro-Kann will give you the much needed chess confidence, while watching their games will inspire you to great creative and performance achievements. The DVD is made for a large audience, starting with beginners up to higher level players. It is carefully structured, which will help you to find your way around the masses of new theory, and to remember just what you need to know before the game. One famous grandmaster confessed me that he studied most of my DVDs, and that he is also using them for his students. Full steam ahead against the Caro-Kann! Grünfeld je velmi dynamické zahájení, ve které se černého pozice často zdá, že drží pohromadě jako na jediném vlásku; a přesto, tato zjevná nejistá rovnováha se zdá být zcela životaschopná - až na nejvyšší úrovni. Když stojí Grünfeld s bílými, má často frustrující pocit, že černý je vždy schopen proklouznout - snaha vyhrát, je jako snažení se chytit rybu s holýma rukama. Ještě více znepokojující je skutečnost, že čím déle budete analyzovat, tím více máte pocit, že je nutná remíza.